Have you ever wanted something but was unable to believe it was possible ? 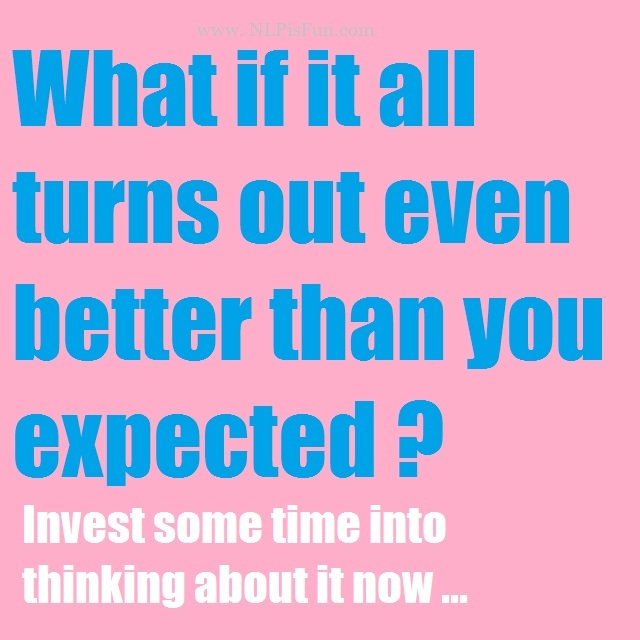 Is the impact of the problem weighing you down, before you give up just consider this one thought. What if it all turns out even better then could could have ever imagined ? Did you know that so many people become paralyzed by the attention that they give to a problem and never ever move into an attitude of expecting a solution for the problem. The solution to any problem will only be found on focusing on what you want. The bigger the problem, the more attention you should spend on the solution. Controlling your state is number one, You must overcome all of the fear that you feel when in the middle of a stressful situation. Empower yourself and use your internal representations to your own benefit. Motivate yourself into action. Speak words of life into your solution, show yourself pictures of success. Visualize the finish line turning out in your favor. Keep going until you feel better and the problem turns into a solution. Be consistent in improving the situation. What if you took just a few moments out to daydream on what it would be like to have it ?